Last weekend was hardware weekend. Our van had problems and we also had plumbing problems. Now that we are not living in a remote village we just head down the street to a hardware store. This might sound boring compared to jungle life, but these trips are often interesting and there is much to learn in the cement jungle. 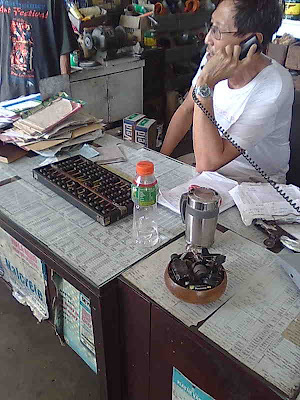 For example, Chinese own many of the hardware stores and several of them still use rather ancient calculators like the one on the desk. 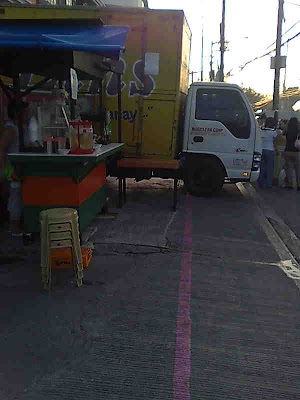 As you walk around the city you will see pink lines on the sidewalks. These lines run under vehicles, around telephone polls and along long stretches of sidewalk. If you follow them long enough, you will come to a men's bathroom. Just thought you might want to know. Sorry ladies, I guess the city budget wasn't big enough or they ran out of blue paint. There are some nice things about garbage day here. First of all, you don't have to sort your recycling. The garbage men do that for you. Being trained in Washington, I help them a bit by pre-sorting my garbage. Second, you don't have to crush your cans. See video to find out who does the job. On the down side, if you leave your garbage can out, the neighborhood dog pack will get into it and make a big mess or your garbage can will disapear. So, you wait until you hear the truck to put out your garbage can out. Unfortunately, the truck seldom comes on schedule, so we feel like we have made a major accomplishment if we get our garbage to connect with the truck. I have seen too many people injured and even killed working with unsafe bucket trucks equipment. It seems to be all about the bottom dollar to most manufacturers which is why you have to be very careful when purchasing new machinery. What an exciting adventure it must be to follow those pink lines around the city! And that can crusher seems a little large for job, but effective! Thank you for sharing your interesting lives!